Our gasthaus in Sigmaringendorf was nice. Contact Ingrid if you want to stay there. No hotels were open for dinner (obviously they all close on Tuesday nights) but we walked to the other side of the Donau and found an open one at which we were the only dining customers. Goulash, schnitzel and coupe Denmark (ice cream with cream and chocolate sauce). The countryside after Sigmaringendorf is more open and we made fast progress. We rode with a German man named Klaus for awhile and met him again several times along the way. Saw one live stork and as we approached and entered Munderkingen saw lots of stork statues. We met a couple of Bike Friday riders here, Marj and Peter from Wonthaggi, travelling with their young granddaughter (on the tandem) for 2 months. Of course they knew Margaret and Graham. Mr Ortlieb would be happy to witness the popularity of his products. 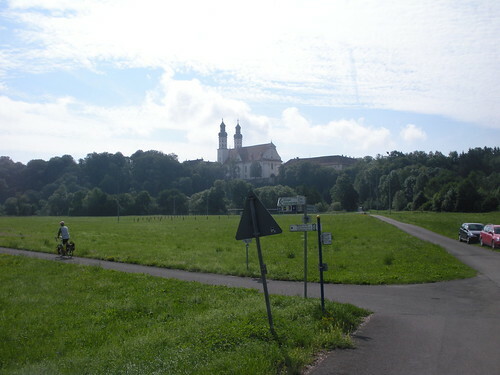 They are seen on the majority of bikes along the Donau-radweg. A noticeable characteristic of Germany has been the number of solar panels on rooves of houses and farm buildings. If only we could see this in Australia where we have plenty of rooves and a lot more sun. As we came closer to Ulm we could see the spire of the munster (highest in Europe). We walked through the town centre, saw a group of young punks with mohawks and big boots, then sat near the munster and had a drink while a group of young people did energetic Christian song and dance. Fabian, our exchange student from 2004, lives on the edge of Ulm in a tiny flat that looks out on to wheat fields. He cooked us a Bavarian dinner of dampfnudeln. It was great to see him again and to hear about his studies, travels and family news. Fabian is an expert on European travel and booked our train tickets to Munich as well as telling us alarming stories about his experiences in Romania and Bulgaria. We are still planning to go there. This entry was posted on 5 August 2010 at 7:48 pm and is filed under Germany. You can follow any responses to this entry through the RSS 2.0 feed. You can leave a response, or trackback from your own site.